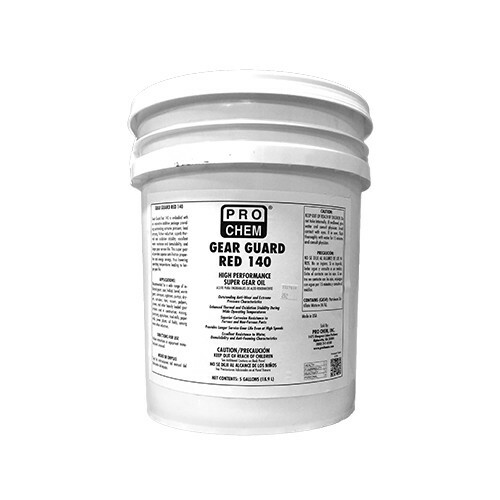 Gear Guard Red 140 | Pro Chem, Inc.
Our new GEAR GUARD line contains an innovative additive package that provides multiple advantages. 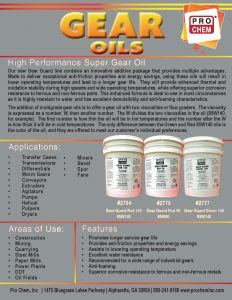 Made to deliver exceptional antifriction properties and energy savings, using these oils will result in lower operating temperatures and lead to a longer gear life. They will provide enhanced thermal and oxidation stability during high speeds and wide operating temperatures, while offering superior corrosion resistance to ferrous and non-ferrous parts. This enhanced formula is ideal to use in most circumstances as it is highly resistant to water, and has excellent demulsibility and anti-foaming characteristics.